Did you mess something up with that special someone? This stunning bouquet will get you out of the dog house not matter what you did. Well, that still might depend on what you did but this bouquet will go a long way. At over two feet tall, this is a fabulous way to show someone just how much you messed up. 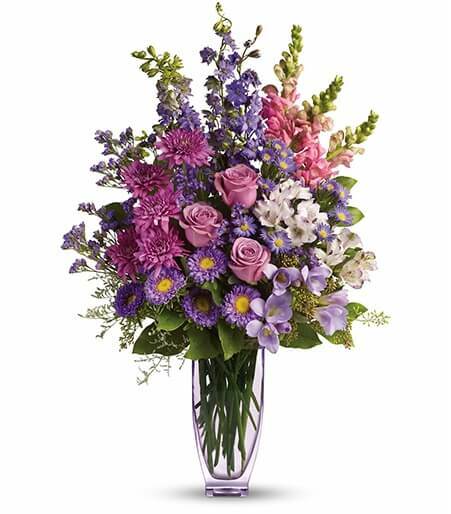 Lovely lavender roses, alstroemeria, larkspur, freesia, matsumoto asters and limonium are joined by light pink snapdragons, purple monte cassino asters and statice in an exclusive lavender vase. Start your sorry with this stunning bouquet.